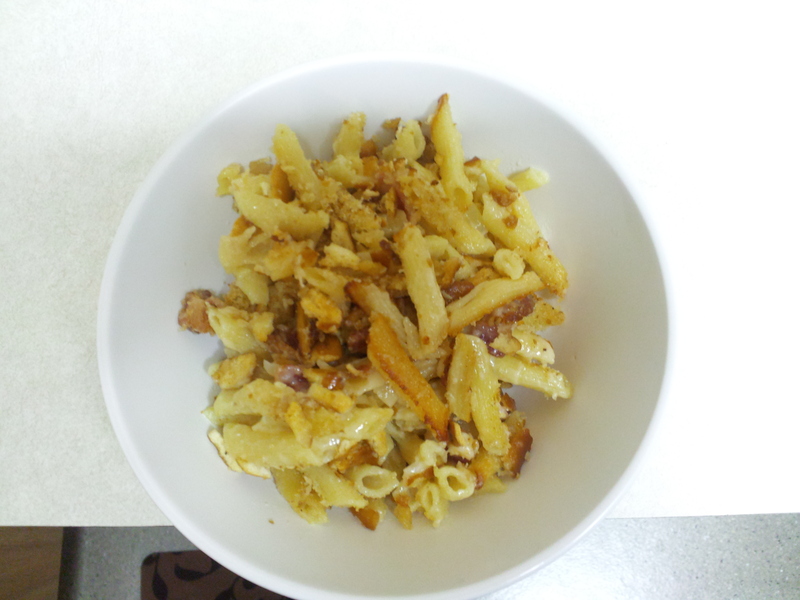 After several recipes, methods, and ingredients, we’ve come down to this: best-yet homemade mac n’ cheese. Cook bacon in a saucepan; set aside. Keep bacon grease to saute onion and garlic. Once browned, add butter. Once melted, reduce heat to medium and add flour. Mix with a whisk; this is the start of your roux. Once combined, reduce heat to low and add heavy cream and milk in 1/4 cup increments, alternating milk and cream. Mix each addition until blended; the sauce will be thick and beige. After all milk/cream is added, turn heat off and add shredded cheese, stirring constantly to incorporate. Add bacon and pepper to taste. In a 9×12 baking dish, add 1/2 of the cooked pasta; add 1/2 of the sauce. Repeat. Mix sauce and pasta to combine. Top with pretzels. Bake for 30 minutes at 400F or until top is browned.